Hilary started her fly fishing career as a teenage guide in West Glacier, Montana. She guided through college, then took her journalism degree to Portland, Oregon where she worked as a television news anchor and reporter. She eventually returned to Montana to co-own and operate Outside Media and Trout TV for nearly a decade. Today, Hilary’s still guiding on the Flathead River and the Middle Fork of the Salmon River and owns and runs a fly shop called Lary's Fly & Supply in her hometown of Columbia Falls, Montana. 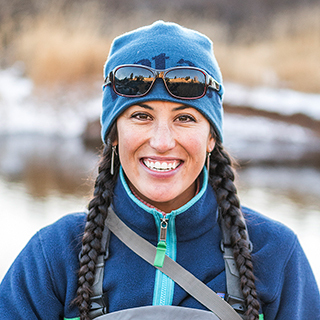 She volunteers as a fly fishing instructor for Casting for Recovery, serves as a national board member of Backcountry Hunters and Anglers, works as a climate activist with Protect Our Winters, and writes for a number of outdoor industry publications. She loves hanging out with her two teen daughters, especially when they volunteer on the oars.